Gordon Moore was born and raised in California. He received a degree in Chemistry from the University of California at Berkeley. Moore then went on to receive a Ph.D. in Chemistry and Physics from the California Institute of Technology. Gordon Moore did all of his post-doctoral work in the Johns Hopkins laboratories. Gordon Moore started his work at Shockley Semiconductor Laboratory but he then left a few years later to join Fairchild Semiconductor Company. This is where he met his friend and co-founder of Intel Corporation, Bob Noyce. Moore served as the Executive Vice President of Intel Corporation until 1975. It was at this point in his life when he became President of the company. Gordon Moore held other various positions in the company as well. In 1979 Moore became Chairman of the Board and Chief Executive Officer. He held this position for many years until 1987, when he then was elected to serve as Chairman of the Board. Moore was named Chairman Emeritus of Intel Corporation in 1997.As well as holding various positions with Intel Corporation; Moore has been a member of the Board of Directors of Gilead Science since 1991. 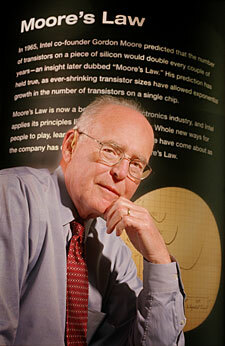 Gordon Moore on top of co-founding Intel Corporation, came up with his own theory about transistor placement. Moore predicted that the number of transistors the industry would be able to place on a computer microchip would double every two years. This theory is still being used by large corporations to this day. Moore had an article published about his research and findings in Electronics magazine in 1965. A number of years later in early 2005, Intel put out a ten thousand dollar reward to anyone who would give them the original copy of the magazine issue when the article was featured. Book stores and libraries across the nation began to put this article under careful watch so that no one would steal the magazine. In the end, they found someone who sold them the article. Gordon Moore and his wife Betty over the years have donated a great deal of money to different organizations. One of their donations of 600 Million dollars was to Caltech and is noted as being one of the highest gifts received by an institution of higher education. Moore also donated a large sum for the construction of the Thirty Meter Telescope. Moore also endowed the Gordon and Betty Moore foundation, which is an organization that works to improve life quality for the future. On top of his many generous donations, Moore has had Libraries and Laboratories named after him and has won numerous awards for his leadership in business and his scientific advancements. The Gordon and Betty Moore Foundation was created in early 2000. The Foundation is "dedicated to advancing environmental conservation, scientific research, and patient care, as well as helping to improve quality of life in the San Francisco Bay Area—Gordon and Betty Moore's home for more than 70 years." ( [http://www.moore.org/] ) Program areas for the Foundation include environmental conservation, science, and the San Francisco Bay Area. In the month of July alone, the Foundation has granted 9 grants ranging from $132,500 to $2,479,879. Overall, the Gordon and Betty Moore foundation has awarded 371 grants adding up to over 1 Billion dollars. Intel Corporation is a semiconductor chip maker corporation that was co-founded in July of 1968 by Gordon Moore and Robert Noyce. 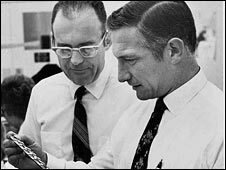 Moore and Noyce were both engineers at Fairchild Semiconductor Company when they met and decided to go in on this new project together. These two men were the first paid employees of the company. When Moore and Noyce first started out, the company was called NM Electronics. A little over a year later, they wanted to change the name to something more sophisticated so they chose Integrated Electronics which is how Intel came about. The headquarters for the company is located in Santa Clara, California. The first product put out by Intel was the 3101 Schottky TTL bipolar 64-bit static random-access memory (SRAM). This product was put on the market in 1969 and was faster than any SRAM to date. They also produced their first bit of random access memory (RAM) in the same year. As with any company, starting up and competing with other foreign companies was a challenge, but Intel overcame the hard times by switching up their tactic and they started to focus on different aspects of computers, one being microprocessors. They found that this was a smart move when large corporations such as IBM started to buy their microprocessors for their own computer units. Intel became most popular around 1990 when their first advertising campaign was launched. A vast majority of computers on the market contains Intels x86 series of microprocessors which they themselves invented many years ago. Today, Intel continues to flourish. In 2005, Apple paired up with Intel by using their CPU's in their Mac computers. The company is expanding into new territory creating new processing factories in the mid-west, they are starting to buy out other companies such as McAfee, and most recently they have begun to look into the world of smart phones which given the right tools and apps, could be very lucrative. Intel also makes and carries a wide variety of desktop computers, laptop computers, chipsets, and Ethernet products. Currently, Intel is preforming research on three dimensional (3-D) transistor products to hopefully increase productivity and efficiency.